My crazy Italian paragliding pilot told me there are two things he loves most about his job: flying next to big birds like eagles, and flying up into the clouds. After launching off the hill and gliding into the air, I immediately understood why. It was really amazing to ascend to an elevation of more than 1500 feet and reach the cloud level, watching the earth drift farther and farther below, as we floated into a thin layer of misty white. 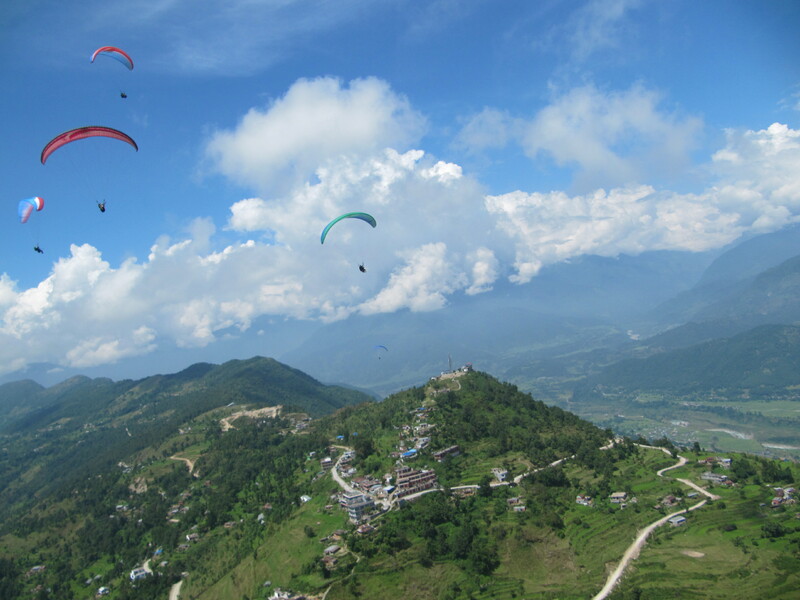 “Cool, I feel like I’m flying!” I said right after we ran off the side of Sarangkot Hill and into the clear blue sky. “You are flying,” he replied. 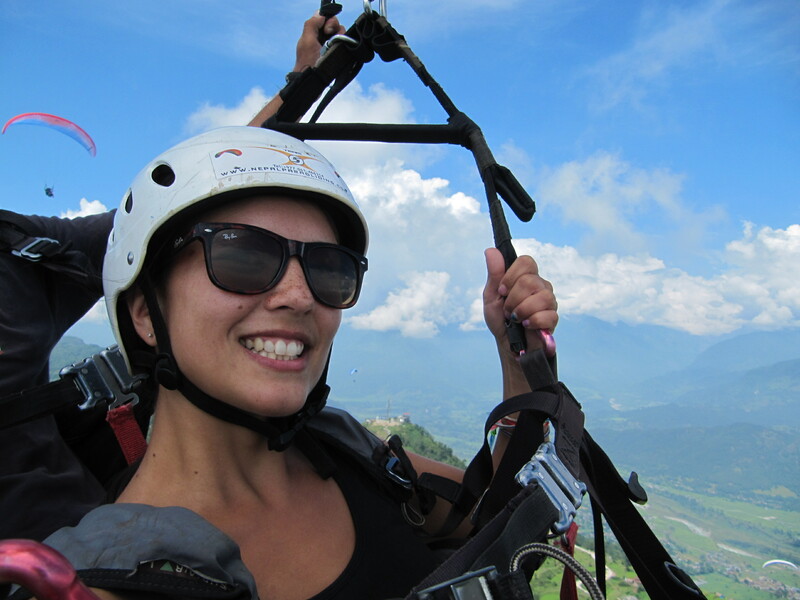 The ride was about 12 minutes until we touched ground, but it felt like we were gliding around up there for hours. I didn’t want it to end. I felt so light and free. 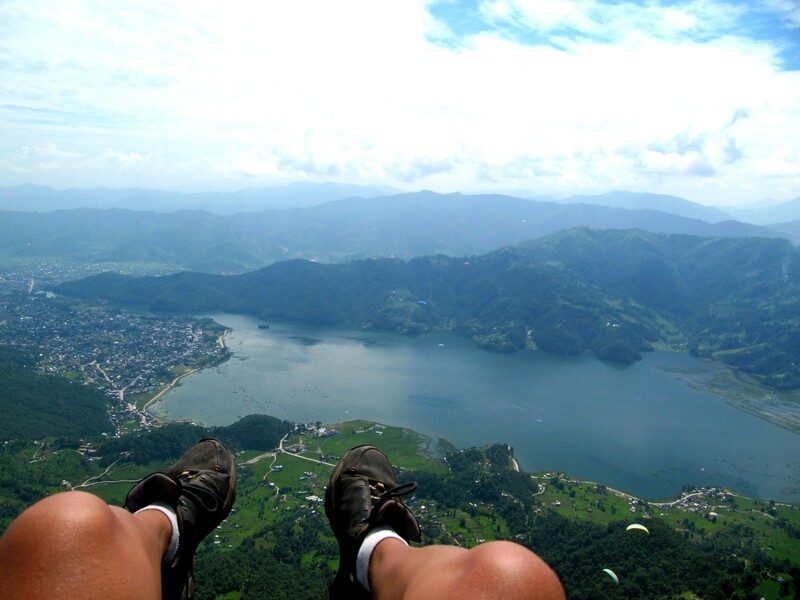 Paragliding is really popular in Pokhara. 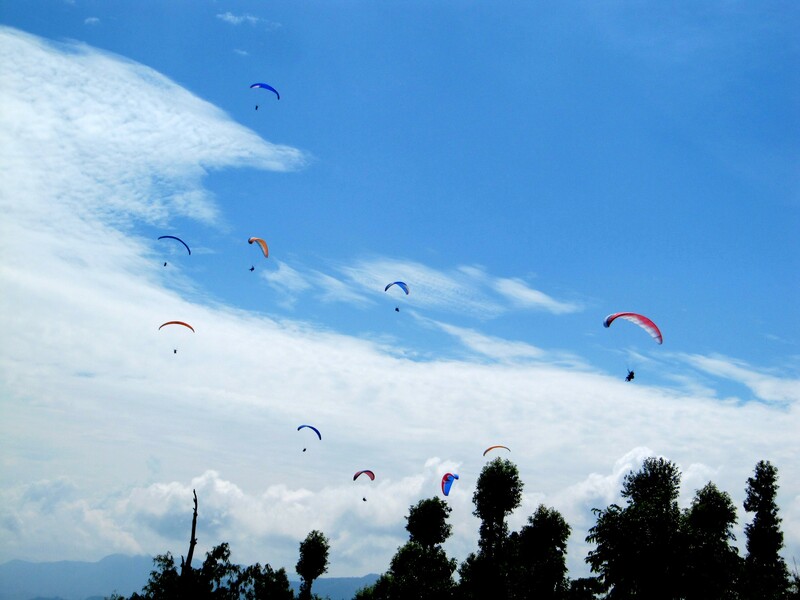 From our perch on the side of the hill at the yoga retreat, we’ve watched dozens of paragliders drift by all day, everyday. It’s easy to arrange from Lakeside when you get into town, with prices averaging around $70 and I’d say it’s totally worth the money — the views are absolutely amazing and it’s just a really cool, free, uplifting experience to be up there with little more than a harness and a parachute above your head. They offered us a photo and video package for an additional $17 — skip that, you can bring your own camera and hold it in your hand. Looking down, there is nothing below your dangling feet but air and the earth is a long way away. At one point, your pilot may ask you if like rollercoasters. What he means is, are you up for doing some flying tricks, like spinning in fast circles and looping upside down. Those who get motion sickness easily should beware: the spins and twirls will get you quite dizzy. I love rollercoasters and have never gotten sick on one, but I ended up feeling really dizzy after landing and walking again on solid ground. The trick part of the ride was kind of intense, so if you’re not into that sort of thing ask your instructor to go easy, and if you’re prone to dizziness I’d recommend taking a motion sickness tablet before you go. Either way you will have an amazing ride. Reach for the sky, friends, reach for the sky. Jamie is getting suited up for her turn to jump off the hill. You were flying and gliding like a beautiful bird!